The last time we stopped by the farmstand at Dunbar Gardens, Steve happened to ask if we wanted any fresh cannellini beans, and he pulled out a large plastic tub full of bean pods. Somehow I had never even thought of getting cannellinis in the shell, and I happily filled a small bag with them. By the time I got around to shelling them, several days later, the pods were beginning to rot – whoops! Guess I should’ve shelled them right away. 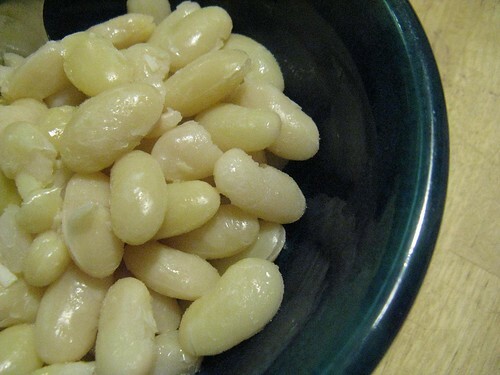 But the beans inside were still firm and unblemished, and turned out to be very easy and fast to shell. Not only did they cook several times faster than dried beans (maybe 40 minutes, max), but the flavor was distinctively different: greener, lighter and at the same time, earthier. I did almost nothing to them: simmered them with water and a clove of garlic, then salted them lightly. We ate them with simple seared lamb chops, a shaved fennel salad with lemony dressing, and a bit of mustard green pesto that had been in the freezer. It was astonishingly delicious. Steve, will you be growing these again next year? I’ll be wanting rather a lot, I think! I’m glad you enjoyed the cannellini beans. We have been growing them every year for quite awhile. 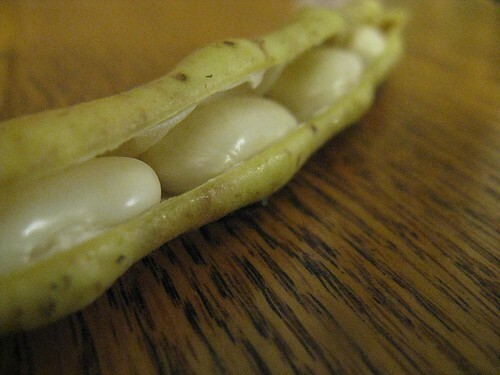 They are our standby shell bean (other than favas). The ones you got were on the end of the season; normally the pods wouldn’t get moldy too fast. 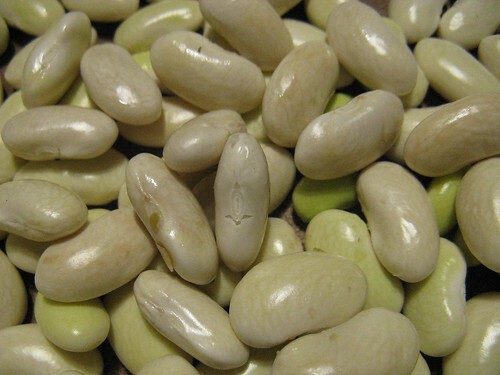 They are best when the pods are a yellow color and the beans have a light green color – not all the way white (though your photos make the ones you had look pretty good). We also like to shell them out, put them into a double layer of ziploc bags then into the freezer for use all year. By the way,I know you are MV farmers market regulars, so I think you can also get them from one of the market gardeners there who “picked up” the variety after seeing them on our tables when we sold there.